100000 years ago humanoids fled from an other universe to escape the sentient Telens, biofab beings that had created them and used them as slaves. With the help of the Scotar, an insectoid shape shifting, teleporting race, they establish on new planets setting up their own planetary systems and hierarchical structures. The Final Assault is the culmination of that war and to the coming of the Telans. It brings together all the parts of the previous books, in a fast paced Galaxy and Alternate reality spanning flight and fight and withdrawal to defend Kronar the home planet established after the first flight to safety all those centuries ago. Spiders webs of intrigue and double dealing start to unravel, the truth of who the Scotars really were are revealed, central characters are revealed to be more than we thought in previous books, and it all makes perfect sense. 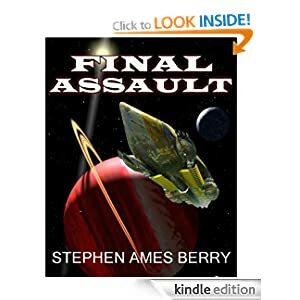 It's Science Fiction and it is out of this world, it scans as you read and it is fast paced action from start to finish. These are all on my list. But he's revising them and re-issuing them, right? So should I wait? All posts and photos copyright to the author, unless otherwise stated, and should not be reproduced without permission. If reproduction permitted, full accreditation and link to site must be provided. The Musings Of A Working Mum And Wife! Ramblings of an old bird! Blog and personal images (c) Tom Stronach . All other content to respective entities. Simple theme. Powered by Blogger.